What is another word for achievement? 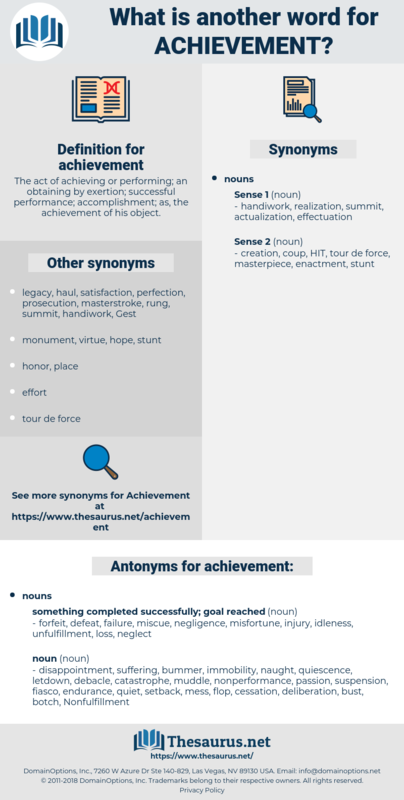 The act of achieving or performing; an obtaining by exertion; successful performance; accomplishment; as, the achievement of his object. milestones, skills, Companies, lessons, breeders, Firms, Achieved, fulfillment, impairment. violations, Irregularities, attacks, filmmakers, breaches, Anomalies, symptoms, offences, Deliveries, conducts, Injuries, abuses, deliverables. data, milestone, objective, actualization, encroachment, advent, contribution, operationalization, prowess, progression, enhancement, reality, carrying-out, outturn, fulfillment, impairment, headway, gain. Succeeded, failed, continued, addressed, Carried, concluded, Passed, said, added, made. improvements, attainment, deliverables, Businesses, successes, realization, Achieving, achieve, excellence. realizations, infringements, affronts, outrages, Achieving. feat, attainment, pursuit, conquest, materialization, victory, realization, furtherance, materialisation, triumph, improvement, embodiment, Achieving, pursuance, creation, concretization, introduction, culmination, achieve, affront, conclusion, fruition, Deliverable, excellence, finalization. forfeit, defeat, failure, miscue, negligence, misfortune, injury, idleness, unfulfillment, loss, neglect. disappointment, suffering, bummer, immobility, naught, quiescence, letdown, debacle, catastrophe, muddle, nonperformance, passion, suspension, fiasco, endurance, quiet, setback, mess, flop, cessation, deliberation, bust, botch, Nonfulfillment, inactivity, inaction, washout, shambles, dud, disaster, inertia, rest. The former was much the more difficult achievement, from the character of the country. But I warn you there is no achievement in the world more difficult than that of becoming a Christian.